Mrs Halford was born in Barnwell County on July 4, 1936 and was a daughter of the late Harry Walton and Susanah Morris Barker. 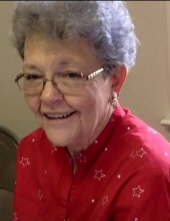 She was a retired employee of the SC Department of Social Services and the Allendale Co. Library. She was a member of the Kline Baptist Church. Mrs. Audrey was a loving wife, mother, grandmother, and great grandmother and will be greatly missed by her family and friends. Funeral services will be held at 2 pm on Saturday, February 2, 2019 in the Kline Baptist Church with Dr. Sidney Limehouse officiating. Burial will follow in the Kline Cemetery. Visitation will be held at Mole Funeral Home on Friday, February 1, 2019 from 6 to 8 pm. Memorials in memory of Mrs. Halford may be made to the Animal Shelter of one’s choice, Public Library of one’s choice or the Alzheimer’s Association, 225 N Michigan Ave. 17th floor, Chicago, Il 60601-7633. Survivors include her children, J. Cameron (Lisa) Halford of Rock Hill SC, Tara (Robert) Keel of Kline SC and Alice (Larry) Powell of Hilton Head; brother, Dennis Barker of Beaufort; grandchildren, Susanah Keel-Arendt, Kristy Keel-Blackmon, Haley Powell, Molly Powell, Lawrence Powell, Lindsey Powell, Caroline Halford, Dawson Halford and Addison Halford; great grandchildren, Lola Powell and Beatrix Powell. She was predeceased by two sisters, Mae Frances Freeman and Bertha Panchula. To send flowers or a remembrance gift to the family of Audrey Barker Halford, please visit our Tribute Store. "Email Address" would like to share the life celebration of Audrey Barker Halford. Click on the "link" to go to share a favorite memory or leave a condolence message for the family.